Powder coating is a technique for paint job known for probably fastest and best results. Needed equipment become relatively cheap, prices for powder coating guns starts from about 200$. 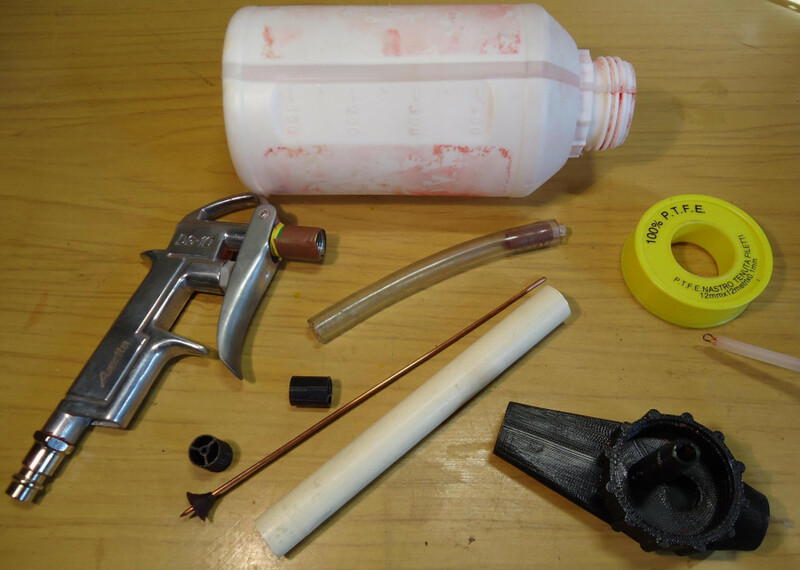 Despite gun itself for powder paint application, technique requires curing the powder by melting it in higher temperature, whats makes a paint stick to the surface and provides nice structural finished surface. For small items an old household oven can be adopted for this job, but of course I would not recommend try preparing food in such oven, once used for curing. Costs rise when you plan to paint higher volume parts, getting specialized oven may be a expense so building own one is considerable. Presented solution may suit hobby needs, where you simply want to save money. If you are completely new to powder coat I would recommend reading this site http://www.powdercoatguide.com/ where most of the basics are explained so there is no need to repeat the same tips over and over again. Results from powder coating with gun described here, before and after curing. 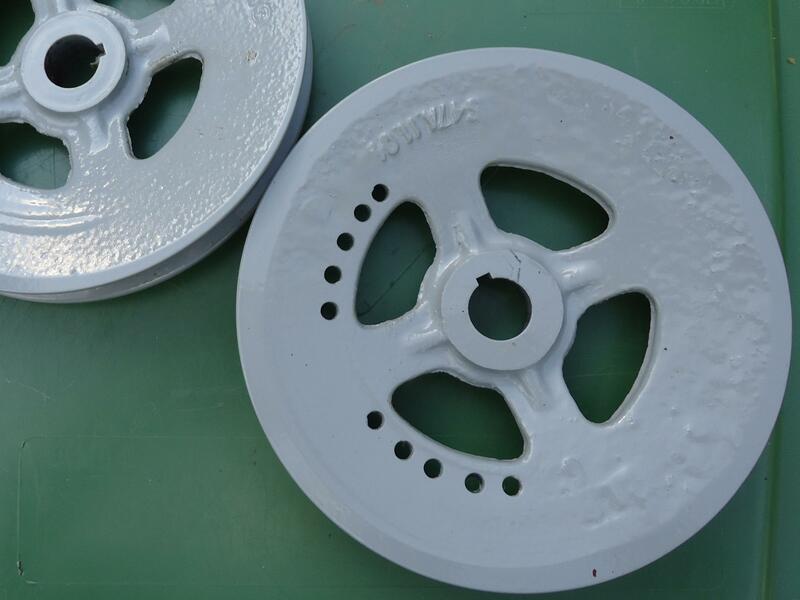 Examples of hobby powder coating finish. Aim is simple - make powder stick to object surface, in possibly regular fashion. One way to do that without contaminations like glue would by by heating the object and dip it in powder. This is fine for really tiny objects. For larger ones there are some useful laws of physics involved and applied. Whole process sounds simple and starts here: coating powder is fluidized by mixing it with air blown through reservoir. Air and powder mixture is feeded along exit pipe to the electrostatic charging system. Two types of those systems (guns) are commonly available: the triboelectric and corona discharge. Charged powder particles adhere to earthed workpiece. Corona guns charges powder by passing it through a corona discharge in the gun nozzle region. 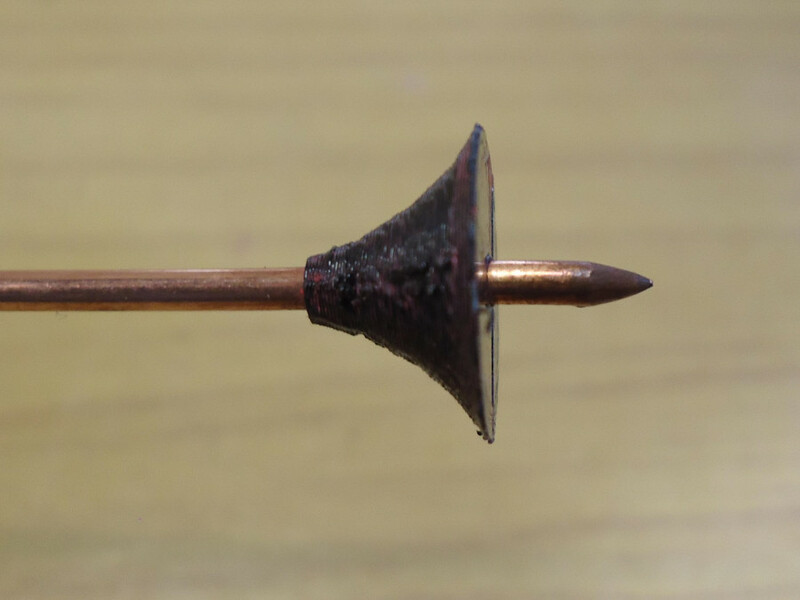 The simplest nozzle is just cylindrical tunnel with one or more sharply pointed electrodes at the end which are under high negative potential of 15-100kV. Presence of negative ions in discharge area makes them connect to the particles that come through, producing charged particle. There is additional electric field which exist between gun tip and grounded piece due to the high potential of the gun electrode. This field can control trajectory of charged particles, when transporting them on workpiece. This results in unwanted faraday cage effect or other words, problems when trying to coat a small concave, sharp edge areas. In the triboelectric gun, powder mixture is blown through special tunnel made of material (PTFE) which maximizes triboelectric charging effect. Shape of the tunnel is chosen in a way to maximize particle collisions with PTFE walls. Charging takes place by charge exchange processes due to particle/particle collisions. Cloud of charged particles, lefts tunnel and is blown towards the workpiece. There is no electric field between gun and grounded workpiece, so there is no cage effect problem. Absence of electrical components and high voltage makes things safer and simpler, there is no need for an electrical power supply. Both methods produce cloud of charged powder, between gun and workpiece. This results in charge electric field directed towards grounded items. Particles that come onto grounded piece adhere by electrostatic force for as long as charge on the particle remains. For more theoretical reading, you can check out this paper: Adrian G. Bailey - The science and technology of electrostatic powder spraying, transport and coating. Medium size PC bottle, that can fit cap thread. Mine comes from plant fertilizer. Typical air blowing gun, popular among all garages. 16 mm PVC (PTFE is better) pipe tube of length about 140 mm. That may be problematic part: air compressor - almost any that provides dry air meets requirements. Buy or build your own - what will be described later. 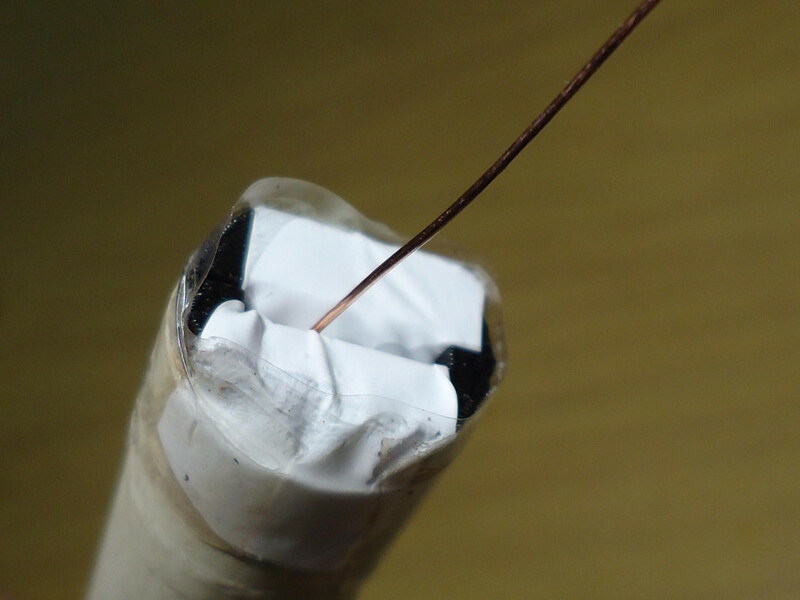 Solid copper wire, with sectional area of 2.5 mm2 (14 AWG). It is typical for electrical installations, but insulation material must be removed. It is important to sharpen one end at about 30 degrees angle. 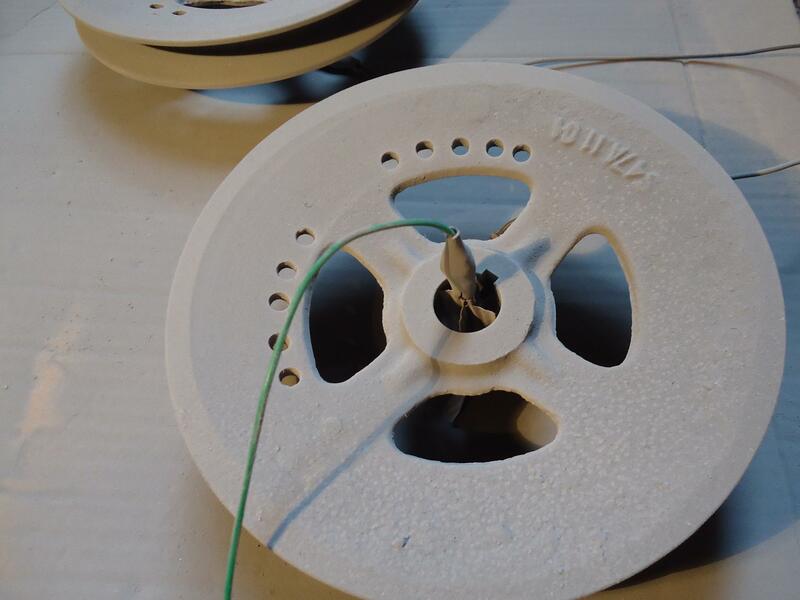 High voltage cable with insulation rated to 60kV or more, length of few meters. I have also checked 75 ohm concentric cable, it does the job but must be high quality one! Negative 15-30 kV DC supply unit. Again, build your own or buy. You can also adjust bottle thread parameters. 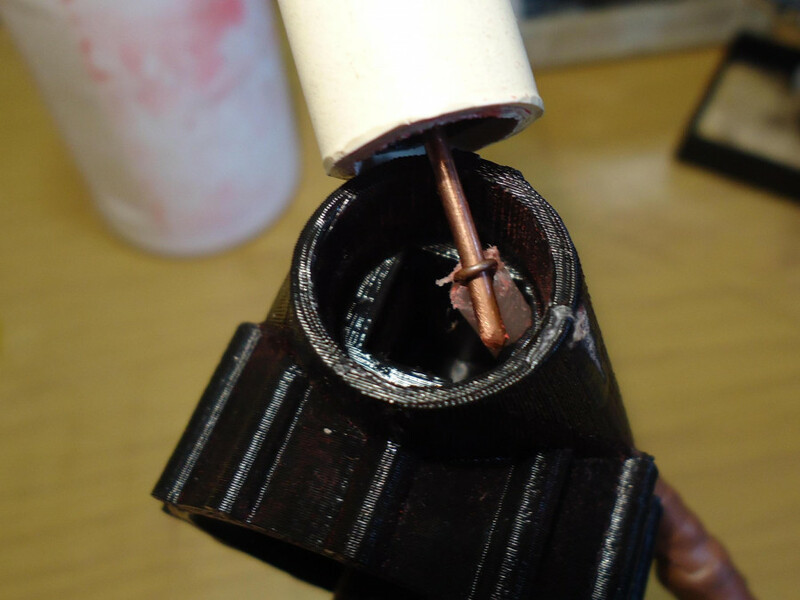 When printing a base is done, check if base loosely screws into a bottle and air blowing pistol fits a bit tightly into intake funnel on the base. Use teflon tape to seal all pressed connections. End of clear PVC pipe should be close to reservoir bottom, when everything is assembled. 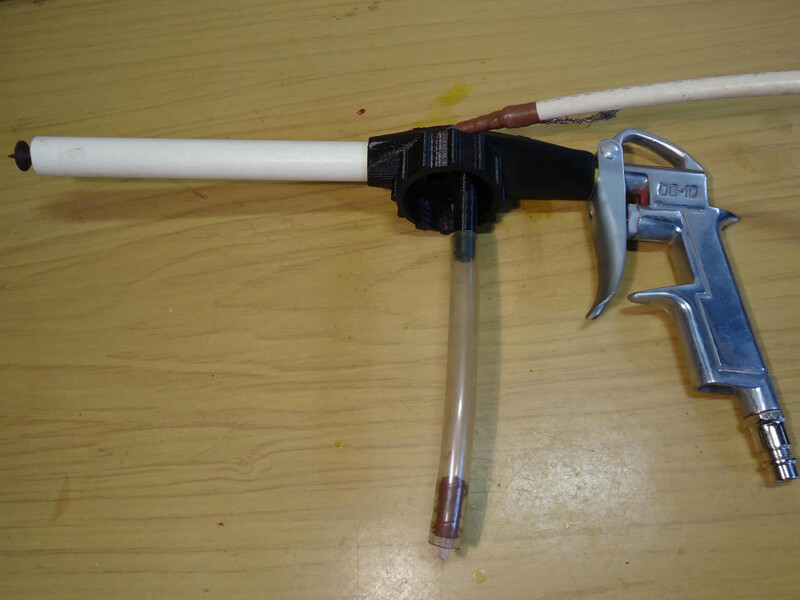 A piece of plastic nozzle can be attached on the end of the pipe, this pipe narrowing will increase air speed within reservoir, for better mixing of course. All powder particles emerging from gun should be highly charged - this is prime requirement for any powder coating gun for satisfactorily results. Single corona may not accomplish this goal as charging process is inefficient. I got just fine, nothing more, results with only one discharge point. Shape of electric field depends of the shape/sharpness of the needle - so it is also important parameter. To increase corona gun performance, arranges of many discharge points are used. But be careful with that: bad arrangement may result in dead zones in charging field, many close-spaced points require too high voltage. Main needle and diffuser assembly within barrel. Without diffuser it is too easy to blow out the currently adhering powder. 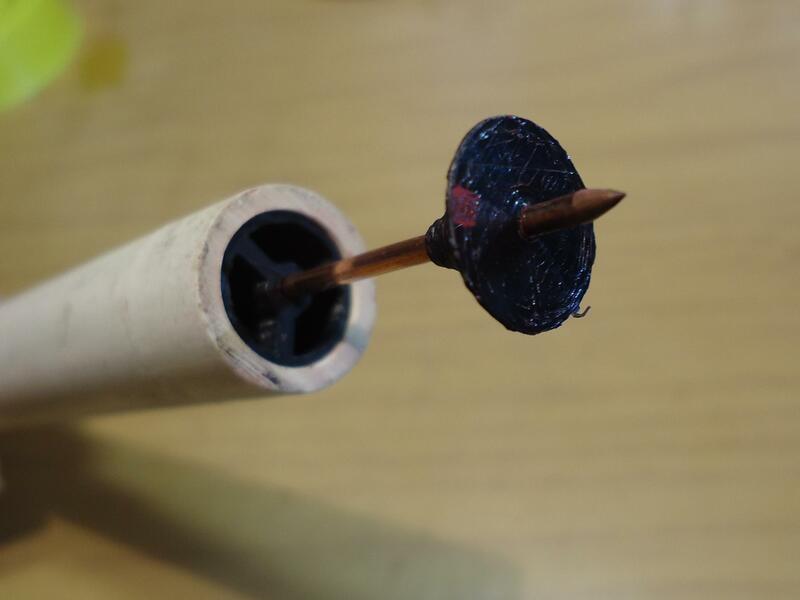 To make a galvanic connection between supply cable and needle, simply prepare a loop out of a portion of cable core. 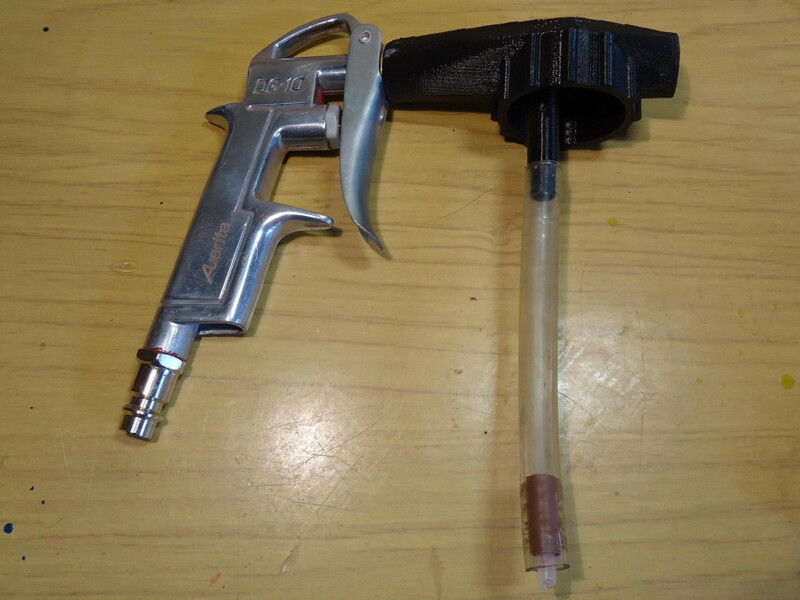 This makes things simpler when disassembling gun parts for cleaning. 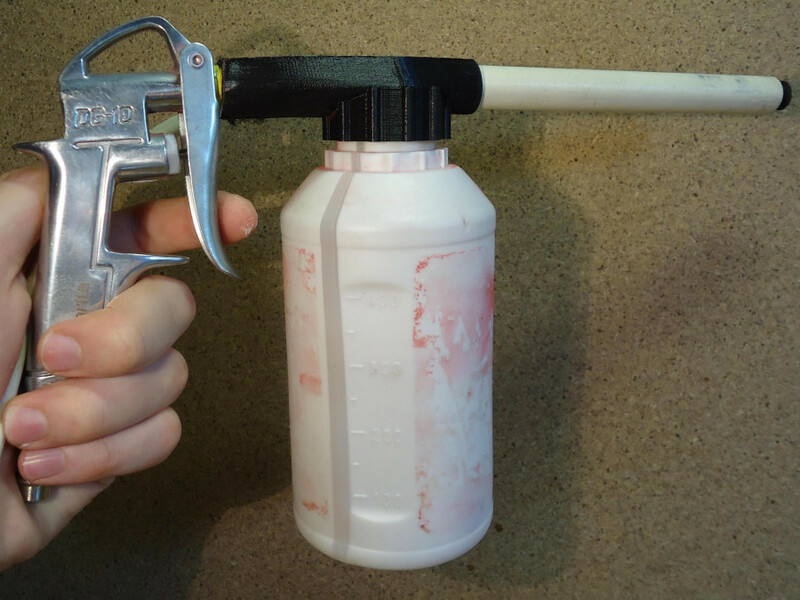 Fully assembled DIY corona powder coating gun. Easiest option is to buy dedicated ~20 kV unit with many stages voltage multiplier. Units described as "air ionizer supply" also work when rated voltage is not lower than mentioned earlier. About building your own supply... 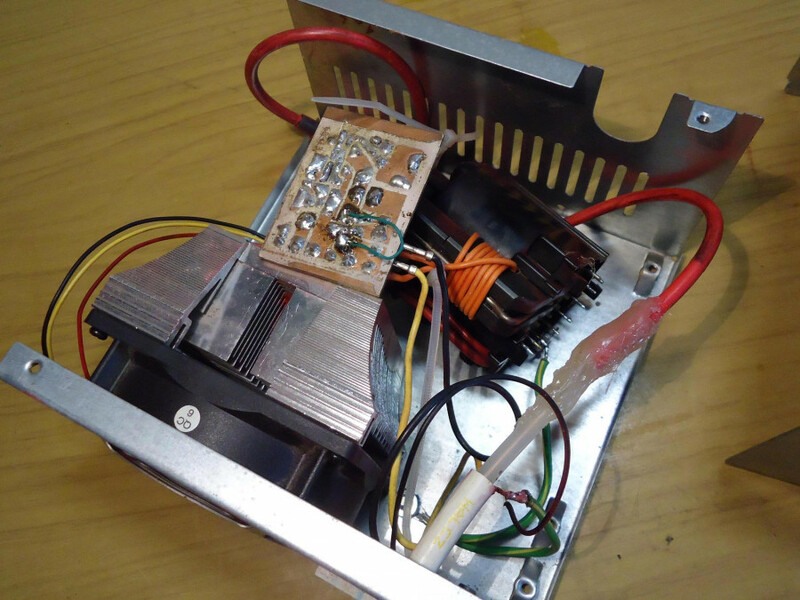 I have checked PSU built long time ago, out of high voltage EHT transformer from CRT monitor/tv and it worked. Besides producing positive instead of negative voltage. Using any circuit in flyback topology (I've been using popular 555) to drive transformer is ok. There is very little power needed (microamps), do not use more powerful push-pull circuits (like ZVS) - in case of failure on HV line it may pump too much amperage and burnout something. It is safer and convince to activate HV by some hand held monostable switch. If coaxial cable is used as hv cable, connect its shield to common ground. It is important to earth ground line and workpiece, not only for safety but better performance! Utilize ground wiring in wall socket or a piece of metal pipe hammered into the ground. 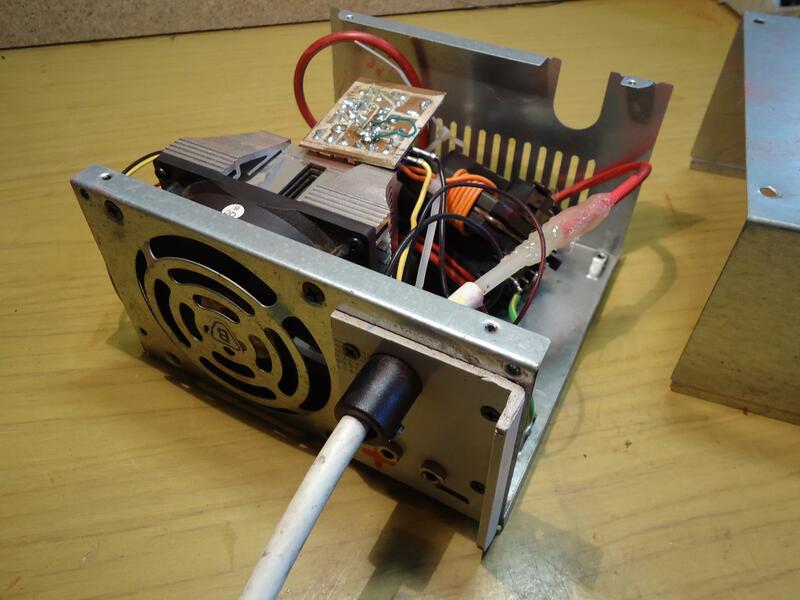 This unit can produce about 60kV at ~60W power consumption. I also attempted to build tribo gun, but it performed much worse. It worked besides the fact that powder waste was too huge, plumbers teflon tape is probably not right choice. I will try to recheck and modify this design later, probably funnel should be shorter and wider, made of thick piece of teflon. Additional parts from duct_parts_tribo.scad needs to be printed. These two halves go inside barrel pipe, check or edit all the dimensions before printing. 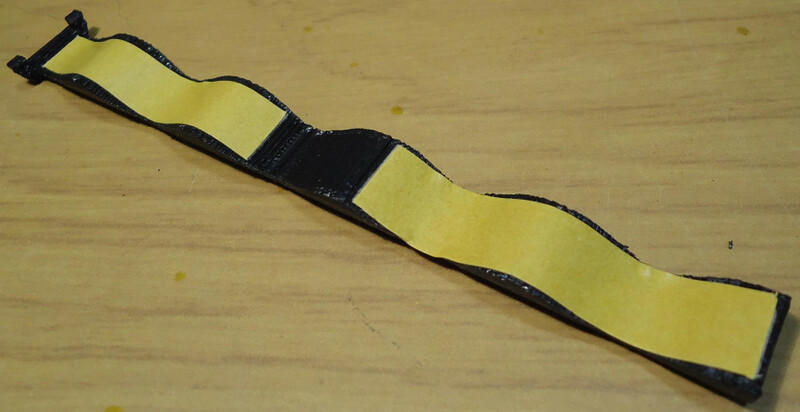 Printed plastic parts for tribo funnel, sticking double-sided tape on each half simplifies lining with the teflon tape. Duct parts with 12mm wide PTFE tape on it. The thicker tape is then better. 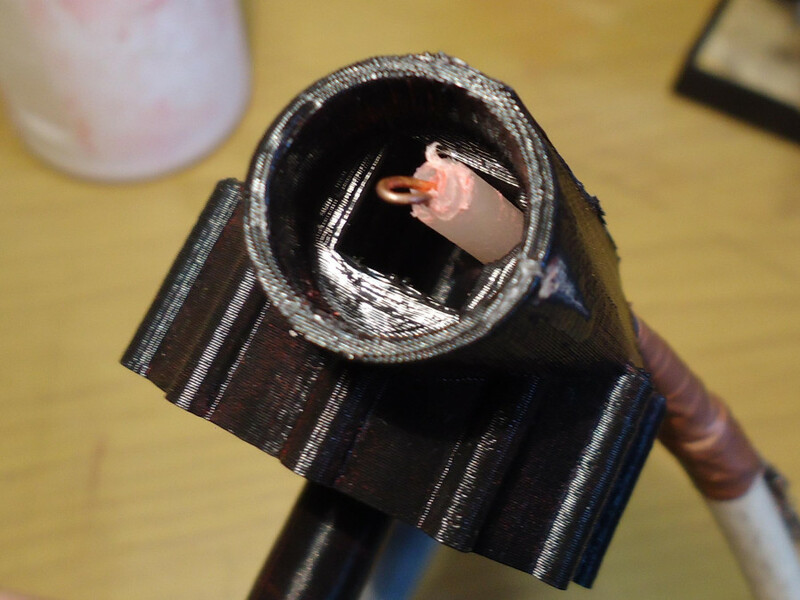 This copper wire (comes from ethernet cable) probe is quite important, it picks up charge excess to the ground. Slide this sandwich into pipe. 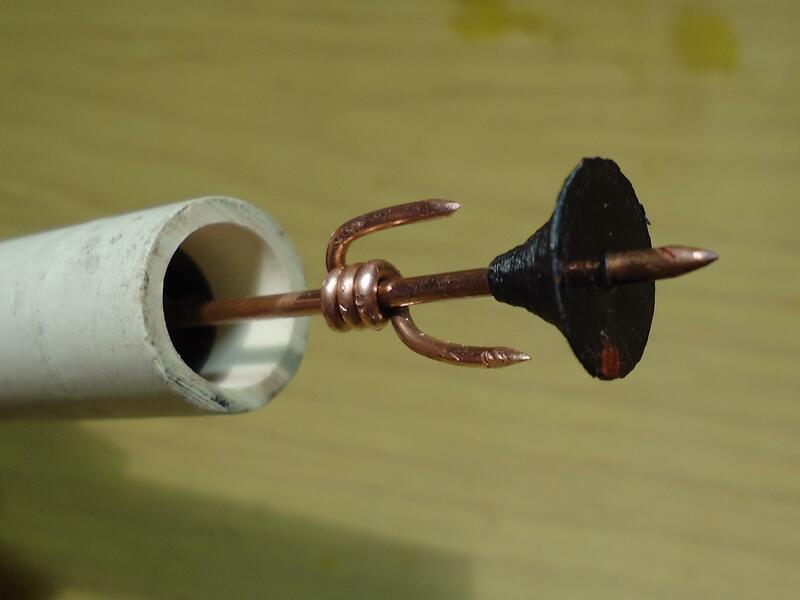 Connect this wire to blowing pistol casing and ground (earth). 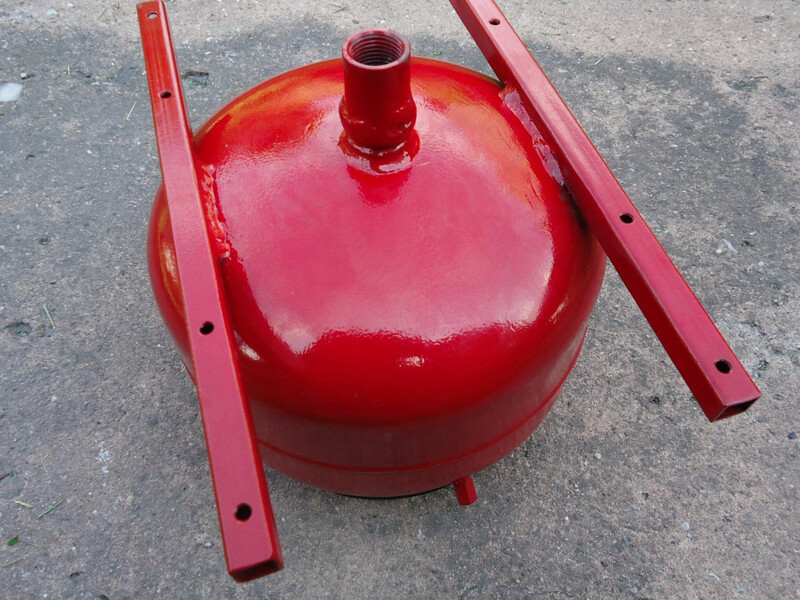 Next, second page describes tips for building an oven and air compressor. For problems related questions please use issue tracker on git project repository (if any). Tags in comment will not work for now. Built on top of PHP 7 and laravel. Found a bug or gap on the website? Report it by mail.